Showers in bathrooms have always been popular. A shower is fast, economical, and wakes you up in a way no bath ever can; it also uses minimal water and power, making it good for the pocket as well as the environment. 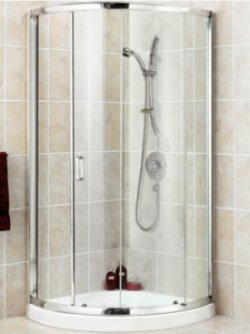 With rising energy costs and water meter charges, a growing number of households are fitting shower enclosures in their bathrooms. Modern shower enclosures can be fitted in a weekend, and can be purchased in kit form from DIY stores like Wickes. Some shower enclosures are easier to fit than others, which must be taken into account when choosing. Generally, framed enclosures are easier to fit than frameless, which can be a challenge for the novice. However, the sleek designer looks and easy clean-ability of frameless cubicles have made them increasingly popular. Modern shower enclosures are made of thickened, tempered glass which may be opaque, etched or clear. The space-saving design of frameless glass cubicles fits perfectly into small bathrooms or tight spaces. The doors pull in or slide, rather than push out. The use of clear glass can make bathrooms appear larger, without being obtrusive. However, frameless clear glass cubicles can leave the occupants feeling rather exposed, so people who value their privacy should choose an opaque or etched design. Despite their name, frameless shower enclosures are not truly frameless – they just have a lot less metal in their design, which makes them easy to maintain and less at risk of corrosion. It also makes them far more sleek and elegant in profile. However, the glass is generally thicker and heavier than in framed cubicles, and they must be flawlessly constructed to prevent leakage of water. By contrast, framed cubicles are easy to build, easily made watertight, and can stand up to a lot of abuse. They also weigh less – something to consider if the cubicle is destined for a loft conversion. However, lighter toughened glass, easy-to-install technology and designer good looks have made frameless shower enclosures increasingly popular at low cost outlets like Wickes DIY, and the divide between the two types is narrowing. There are five main door types for shower enclosures. These are pivot; bi-fold; hinged (also called frameless); swing-fold and sliding doors. It’s important that, if you are buying a door separate to a cubicle, it is compatible with the design and height of the unit. Generally, cubicle doors are provided for left or right opening. Pivot doors swing on two pins located at the top and bottom of the frame, providing a wide opening for the user. Bi-fold doors make the best use of space, as they don’t open into the room. Hinged doors are pure glass panels that provide a wide entrance for frameless cubicles. Swing-fold doors are full-size doors that swing inwards, without causing obstruction. Sliding doors, as the name suggests, slide sideways. Shower enclosures themselves come in a range of designs to fit even the most awkward of bathrooms. These include corner-entry, walk-in, off-set and pentangle styles. In addition, doors and extension panels can be bought separately to fit existing recesses.